With a choice of sizes and combinations, Adam Equipment's calibration weights simplify the process of external calibration on precision balances and digital weighing scales. Weights are crafted of rugged cast iron or highly polished stainless steel and are packaged individually or as part of a boxed set. Manufactured to international standards (OIML), Adam Equipment calibration weights are available in the following classes: M1, F1, E1 and E2, and in sizes ranging from 1g to 20kg. Adam provides several options for M1 class weights, including a choice of cast iron or highly polished stainless steel construction. Standard M1 class weights are used to calibrate most standard weighing machines including bench scales, counting scales and compact balances; M1 class block calibration weights feature higher weight capacities and are used to calibrate large platform scales and floor scales. Class F1, E1 and E2 weights are fabricated of highly polished stainless steel and are used for externally calibrating high-precision and analytical balance models. All calibration weight sets are packaged in a lined aluminium box, complete with forceps and white cotton glove. Adam's OIML approved cast iron block calibration weights for external calibration of larger scales and platforms. Adam's OIML weight sets are available in M1, F1 and E2 classes. 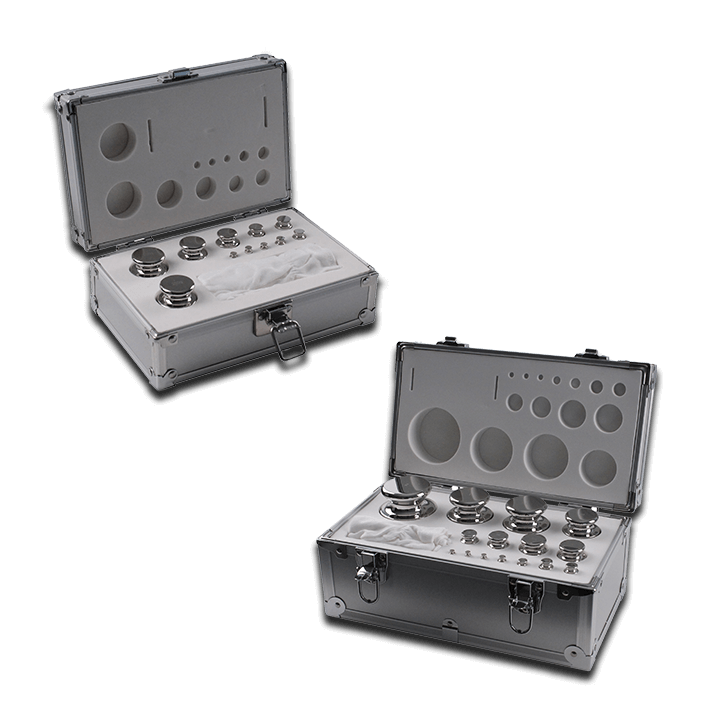 Our calibration weights are constructed from stainless steel with cavities and are packaged in an aluminium box when purchased as part of a set. Adam’s OIML calibration weights are available in sets or separately. Individual weights are packaged in a plastic box complete with forceps and white cotton glove.